Artis Gilmore played in the ABA and the NBA. Artis was inducted into the Naismith Memorial Basketball Hall of Fame on August 12, 2011. Gilmore followed 5 All-Star seasons with the Kentucky Colonels of the ABA by becoming the 1st overall pick of the 1976 NBA dispersal draft by the Chicago Bulls. After four All-Star selections in five solid basketball seasons in Chicago, Gilmore was traded to the San Antonio Spurs in 1983. Twice again he was an All-Star in San Antonio. In Gilmore's complete pro basketball career, he was an eleven-time All-Star, the ABA Rookie of the Year, and an ABA MVP, and he remains the NBA career leader for field goal percentage. Nicknamed "The A-Train", the 7' 2" Gilmore once played in 670 consecutive games. 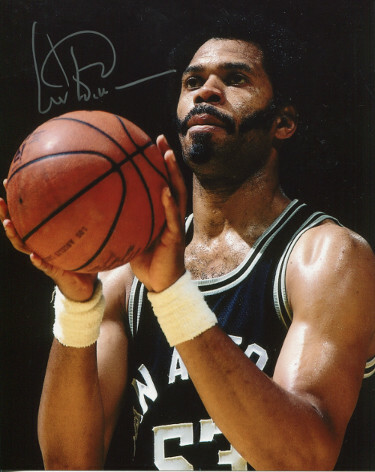 Artis Gilmore has hand autographed this San Antonio Spurs 8x10 Photo. Certificate of Authenticity from Athlon Sports Collectibles.